Aim: To continue to improve on Breast Stroke Technique, working on the leg kick, arm pull and overall timing of the stroke. Other skills and contrating activities will be included. Suitability: For children aged 8+ who cannot swim without buoyancy aids. Water Depth 1.2 metres. 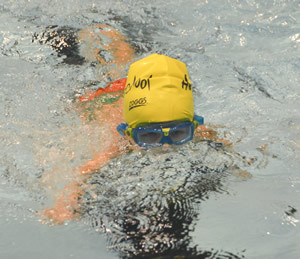 Aim: To learn to swim a minimum distance of 10m on front and back, with technique for Front Crawl and Back Stroke. Building on water confidence, such as Submerging, Floating and Jumping in. Introduction to Breaststroke and Butterfly also. After completion of this stage, older children should automatically progress to Stage 3. Intensive lessons are bookable direct with Splashpoint Leisure Centre Reception and are usually available to book 5 – 6 weeks in advance of each course. They are booked on a first come first serve basis and are open to member and non-members.